To say I am addicted to Pinterest would be an understatement. Sitting in front of the computer for hours at a time scrolling from one picture to the next is my usual activity in the evenings. Of course, my favorite is looking at embroidery and sewing. Frequently, I will "visit" the various web sites. It just amazes me the amount of information available. And I'm not talking about junk. There is some really good information. I learned to sew by watching my mother. Most of my childhood she would make my clothes. When I began high school she would ask my sister and me if we wanted her to make our new school clothes or go shopping. My sister always went shopping for her clothes. I always asked Mama to make my clothes. We would go to the various sewing and fabric stores and sit for hours going through pattern books. Once we found the patterns we wanted, we would shop for the fabric. At home Mama would start cutting out the pattern pieces and we would pin and cut the fabric. Then away she went stitching everything together. Nothing looked home made. Eventually, I left home and got married and began my own life in another state. One Christmas my husband bought me a new sewing machine. That was in 1975 and I am still using that sewing machine today. However, I stopped sewing for many years because I couldn't figure out how to get the tension right. Once the internet became available, one of the first things I looked up was how to set the tension on a sewing machine. A website popped up and voila, the article answered my question. Wow! Now there are people who never knew a time without the internet. That is so amazing to me. They have had answers to all of their questions for their entire life. It is refreshing to see on Pinterest so many young people interested in self-sufficiency. Reminds me of the 1960's and 1970's. Young people interested in sewing, whether it is on a machine, by hand, crocheting, knitting, embroidery or tatting is just wonderful. So many people today don't know even how to hem their pants. It fills my heart to see so many young people today using their creativity to make things they need. They are using their inquisitiveness (not sure that's a word) to find out how things were done in days gone by and using that knowledge to apply the practices to today. I love all of the items they can make out of pallets and even empty toilet paper cardboard. I applaud each and every one of those young people. Let me make a little contribution here, for whatever it is worth. One of the first things my mother taught me to make on a sewing machine was pot holders. Pot holders are a great first project. 1. Take 2 pieces of cloth. Cut them together (one on top of the other) in the shape you want your pot holder. Square is the best choice. Trust me on this. 2. Find some scrap material and place the scrap fabric, flat and smooth, between the 2 pieces of cut fabric, as though you are making a sandwich. However thick you want your pot holder is the deciding factor in how much scrap material to place between your fabric. 3. 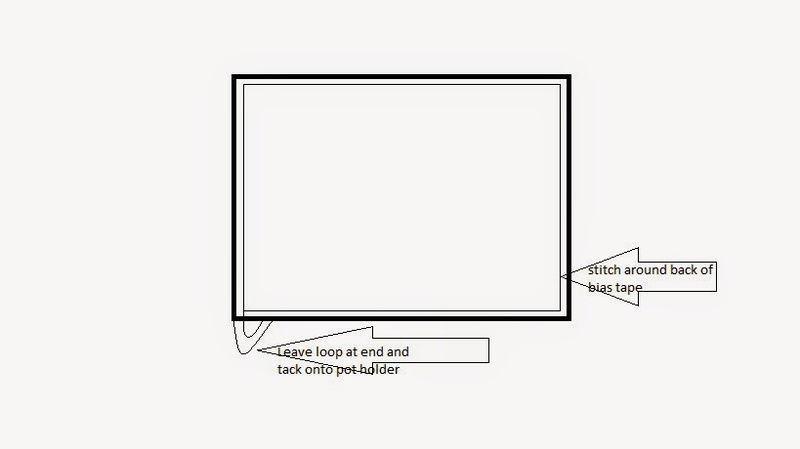 With your fabric sandwich together, pin the entire thing together using straight pins. 4. Cut off any of the scrap fabric sticking outside the top and bottom square (or whatever the shape is) so everything has a nice edge. 5. Now you are going to sew on the machine. Choose your thread and fill your bobbin. 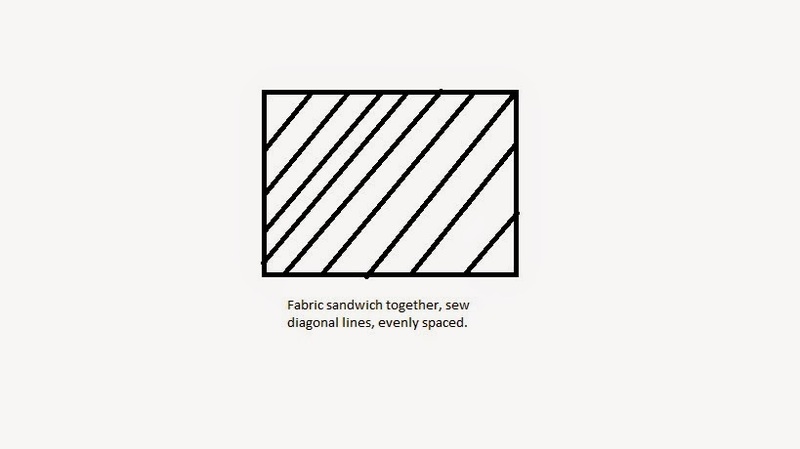 Sew diagonal lines evenly spaced across the fabric sandwich. 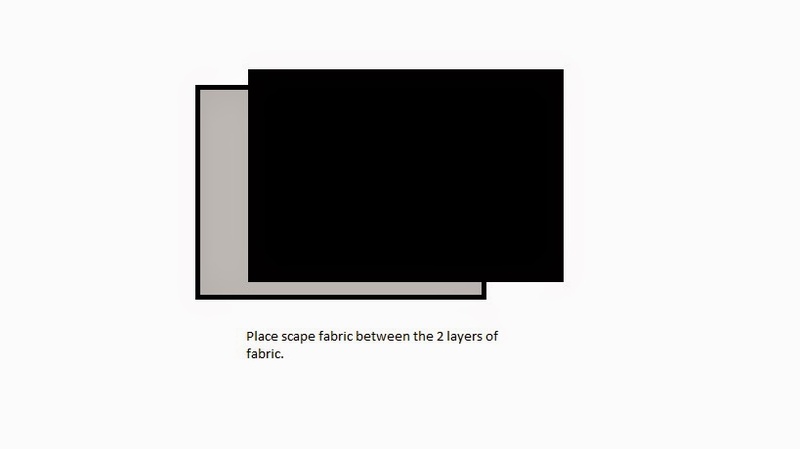 If you have too much fabric filling, you may have a tough time sewing through all of the layers. 6. 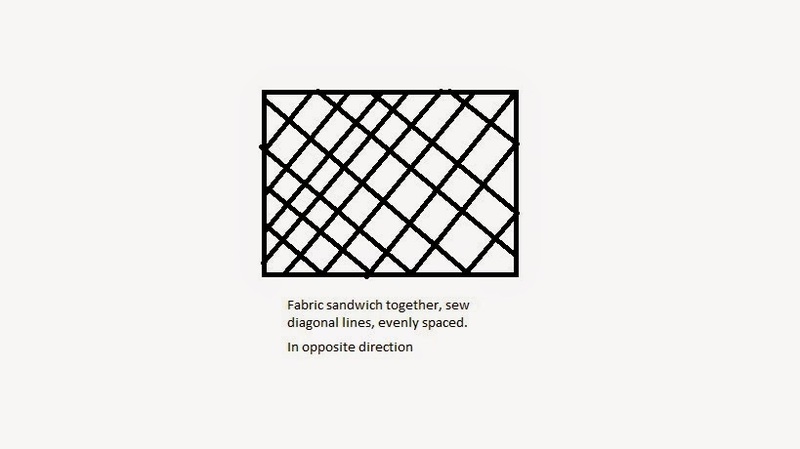 Turn the pot holder-to-be to the opposite angle and sew diagonal lines evenly spaced throughout the fabric sandwich. This should create a cross hatched look. 7. Now sew around the edges, not too close to the edge, probably 1/2 inch or 5/8 inch. Just a straight line around the edge. 8. If there is fabric sticking out, trim it off. 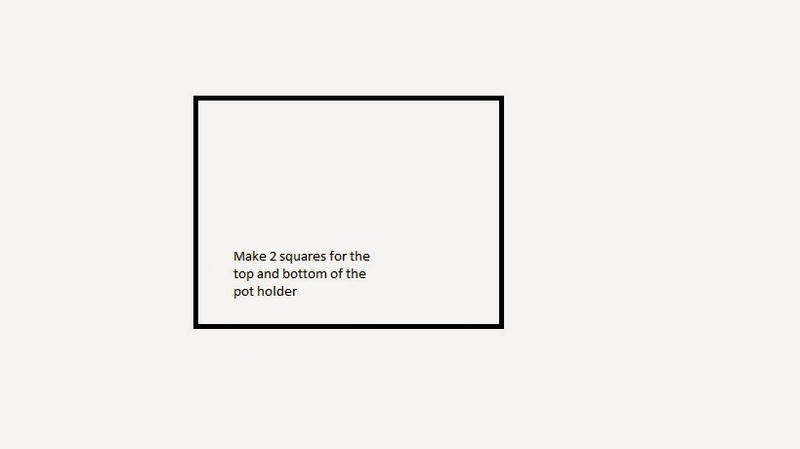 If your pot holder got a bit out of shape, square it up, again. 9. At this point you need to finish the edges of the pot holder. You can hem around but that might get too thick. Ideally, you should apply bias tape which you can get anyplace that sells sewing notions. 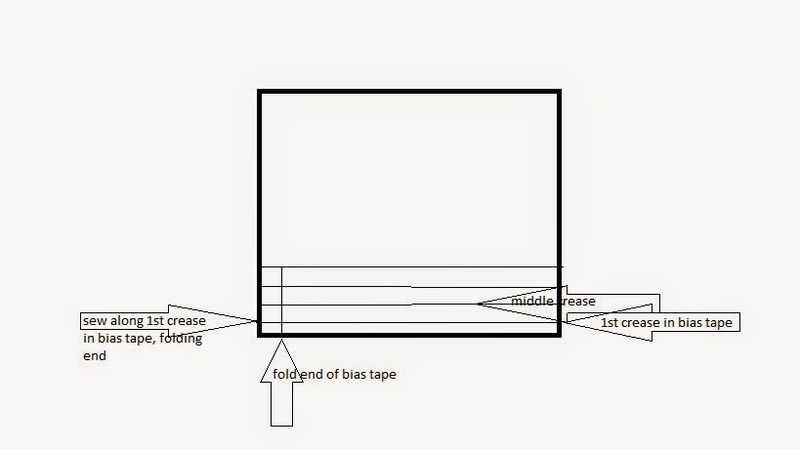 Open the bias tape, which is folded over 4 times. Match the edge of the bias tape to the edge of the pot holder with the folded portion toward the inside of the fabric. Pin in place all the way around leaving extra at the beginning and end. Fold a length, any length, of the bias tape onto itself so the end edge has a hemmed look, then sew all the way around on the first crease of the bias tape. You will sew through the bias tape and through the edge of the pot holder. At the end, leave a length, long enough for a loop. Just let the end hang out there for now. 10. Fold the bias tape over onto the back of the pot holder. The middle crease on the bias tape will be your pot holder edge. If the middle crease isn't reaching the edge, then trim the pot hold closer to the seam until the middle crease of the bias tape can fold and create the edge. Turn the bias tape onto the back of the pot holder. Leave the last section of the folded bias tape folded to give a pretty hem like edge to the bias tape. 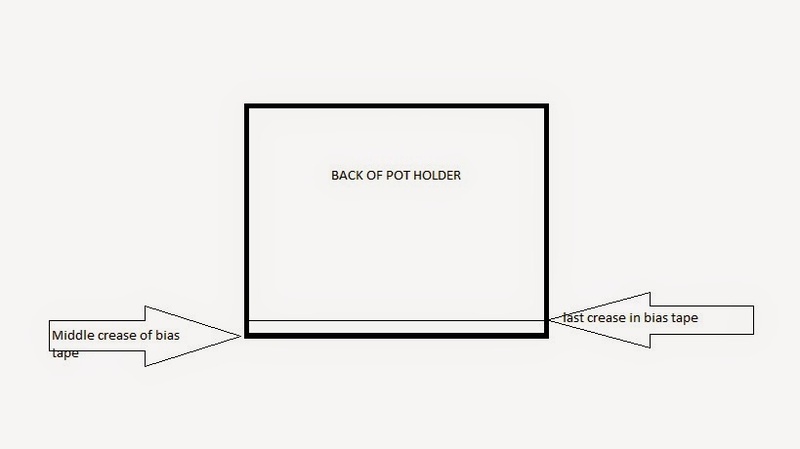 Pin around the pot holder. Sew the bias tape just on the inside of the last edge of the bias tape. As you finish sewing the bias tape around the pot holder, continue onto the last length of tape that is hanging out there, sewing it closed. Leave enough to turn the end onto itself for a hem look and tack the end onto the pot holder. Clear as mud, right? Okay, not the best tutorial in the world but it is what I can do. Maybe someday I'll add photographs. The whole point is this is a first sewing lesson kind of thing. Don't even expect to get it right the first time. As the old saying goes, practice makes perfect. Keep doing it over and over until you get something you would call a pot holder.